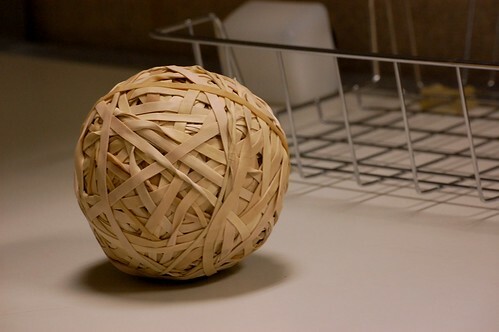 This all started because I left my rubber band ball lying out. Inevitably, a boy picked it up and started bouncing it. First he was bouncing it against the floor. Then he was bouncing it against the wall, playing a little solitare game of catch. Then his friend arrived, and tried to catch it off the bounce. They starting counting how many times they could bounce it to each other without dropping it. Then their math teacher noticed what they were doing. She pointed out that this game wasn't very hard, because they were standing right next to each other. They moved away from each other laterally, maintaining their equal distance to the wall. "This is easy! See? We just have to throw it in the middle." Then she asked one boy to take two steps forward. The game changed. They could still get it to each other, but it was trickier. They tried standing various distances from the wall. Classmates joined in. The teacher wondered out loud if someone could mark an X on the wall for any two people, such that throwing the ball to the X would guarantee a catch. This is how my exponents unit was interrupted for a week, how 12 9th graders solved a problem and didn't care they were doing math, and why my north wall is sporting a galaxy of multicolored X's. Give up? The solution is here.